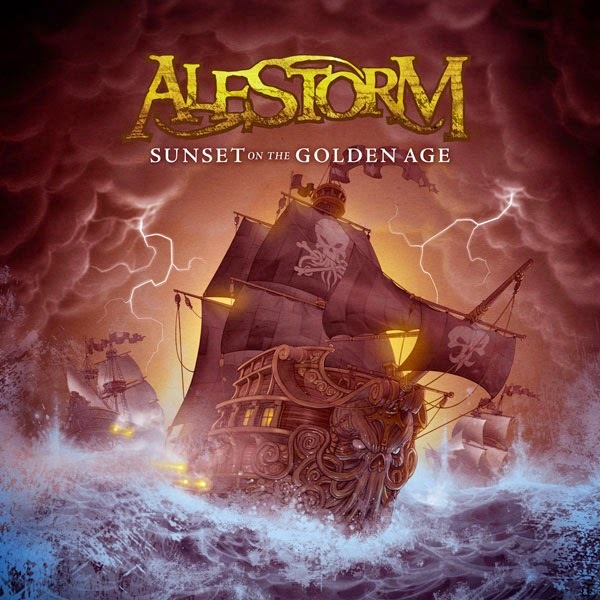 Hall of the Mountain King: Review: Alestorm, "Sunset on the Golden Age"
While there’s not anything amazingly different than they’ve done before, Alestorm have honed their cutlasses to a razor-sharp point on this album. While there’s typically been at least a song or two on each of their records that I didn’t really care for, that’s not the case here. They do throw a few new wrinkles at us. The heavily symphonic “Magnetic North” features a bit more of a folk metal feel in the early going and in some of Bowes’ keyboard lines. It also gives us the first real breakdown that I can recall in an Alestorm song with some heavier, growling vocals on that portion. “1741 (The Battle of Cartagena)” opens with what sounds like music from an old-school video game before things get cranked up for an epic tale of high seas battle that also features more of that heavier vocal style. “Surf Squid Warfare” opens with some surf-rock guitar riffing from Dani Evans and a nice big riff between the verses, too. Of course, there’s plenty of silliness throughout the record, most notably the bashing “Wooden Leg!” which chronicles something of a pirate version of Monty Python’s Black Knight. The band also continues its tradition of strange cover tunes by taking on Taio Cruz’s “Hangover” and giving it a piratey flair. The song also features the first rap on an Alestorm record, from MC Immobilizer of friends and fellow pirate metallers Lagerstein. Drummer Peter Alcorn, who joined for the band’s last album Back Through Time, continues to provide some serious chops that have enhanced and brought a heavier sound. But it’s Bowes’ pitch-perfect pirate persona that continues to make this work better than any other act that has jumped on the bandwagon. There is, perhaps, a bit of concern for fans, though, in the title of the album and the closing track, an epic 11-and-a-half minute song that features lots of imagery about sunsets, sailing away, turning the page, starting a new chapter and traveling to another Golden Age. The tune has a great head-bobbing riff from Evans, accented by Bowes’ keys, and delivers another breakdown that features some proggish keys. Perhaps it’s nothing more than a story Bowes came up with, but it certainly feels like a statement that maybe changes are coming. It would be understandable, I suppose, since the pirate thing can probably only go so far before it gets stale, but I hope if change is inevitable that it delivers as much fun as this album does. I’ve grown to love Alestorm more and more through each record, and truth be told, they’ve helped see me through some pretty dark moments in recent years simply because I can’t be unhappy when I have their music blasting out of the speakers. The songs are just so joyful and catchy, and the hooks get stuck in your head. Listen to this album’s lead single “Drink,” and just try not to walk around singing that chorus for days. When the songs are playing, I find myself tapping my feet, bobbing my head, waving my hands and, occasionally, acting like a pirate. With my headphones in at work, I sometimes get strange looks and realize that I’ve probably delivered a line out loud with a piratey “Arrrr.” Listening to “Drink” while writing this review, I found myself raising my cup full of soft drink in a toast and singing along. There’s something to be said for music that can have that kind of effect on you, no matter how goofy it may be. In the end, I think music’s job is to bring you joy in some way, and in good times or bad, Alestorm always manages to lift my spirits with songs about lifting theirs.